An Insider will meet and greet you and your group at the Bole International Airport in Addis Ababa and transfer you to the hotel. Overnight stay in Ghion Hotel. After an early breakfast, drive north to Bahir Dar via Debre Markos. On the way visit the Debre Libanos Monastery and the Portuguese bridge, known as the first bridge in Ethiopia. Afterwards, you will pass through the spectacular Blue Nile Gorge before stopping in Debre Markos for lunch. Overnight stay in Kuriftu Lodge. After breakfast, take a boat trip on Lake Tana to various island monasteries like those on the Zege Peninsula and Kibran Gabriel (women are not allowed). In the afternoon, you will drive to the Blue Nile Falls for a short hike to the falls. Overnight stay in Kuriftu Lodge. After breakfast, drive three hours north to Gondar. On the way, enjoy the beautiful landscape of the Amhara highlands. After arrival, visit the castle compound of Fasilides and the Debre Birhan Selassie church, one of Ethiopia’s most famous churches. Overnight stay Goha Hotel. Depart early in the morning from Gondar, driving to Sankober, a campsite in the national park. On the way, Insider guides will handle park fees, local guides, and scouts. Shortly after, you will start a 3-4 hour hike from Buyit Ras to Sankober. Back in Sankober, enjoy beautiful views from the escarpment where you can observe the Gelada baboons and perhaps the Walia Ibex. In Sankober, an Insider will meet you with your supplies. Overnight stay in Simien Lodge. In the morning after having breakfast, depart north for Axum enjoying spectacular views of the Simien Mountains on the way. After stopping for lunch in Adarky, proceed driving through the Tekeze Valley to Axum, home of the ancient Axumite Empire, the Queen of Sheba, and the Ark of the Covenant. Overnight stay in Yeha Hotel. Explore Axum—a UNESCO World Heritage Site—and visit the ancient stele, granite monoliths dating from pre-Christian times. Visit the church compound of St Mary of Zion Church where the Ark of the Covenant is stored. Overnight stay in Yeha Hotel. Take an early morning, short flight to Lalibela. Upon arrival you will visit the 11 monolithic churches that were built in the 12th century and are carved into the bedrock. These churches have been classified as a UNESCO World Heritage Site. Overnight stay in Hotel. After breakfast, continue visiting the churches or hike to Asheten Mariam, a rock-hewn church in the mountain above the town. In the afternoon, you will visit the Nakutelab Rock Hewn Church, built under a natural cave. Overnight stay in Hotel. After breakfast you a short flight takes you back to Addis Ababa, arriving in time for lunch. The afternoon is free for leisure and shopping. Overnight stay in Ghion Hotel. An early morning drive after breakfast will take you to Awassa, while on the way you will visit Lake Ziway. In the city of Awassa, enjoy the life of a vibrant city with diverse ethnic mix and walk through the daily market where colorful villagers negotiate for fish. Overnight stay in Lewi Resort. In the morning, visit the fish market on Lake Awassa and see hippos, grivet monkeys, and colobus monkeys. Birdwatchers will especially enjoy the silvery-cheeked hornbill, black-winged lovebird, and Abyssinian black-headed oriole. Arrive to Dorse and visit the local village. Overnight stay in Dorze Lodge. Early in the morning after breakfast drive to Nech Sar National Park to see savanna wildlife such as Swaynes hartebeest, lesser and greater kudu, and Bruchell’s zebra. In the afternoon, take a boat ride on Lake Chamo to visit the ‘crocodile market’ and hippo pods. Overnight stay in Paradise Hotel. Drive to Turmi via Arbore through the Weyto valley, try to arrive on a Friday (market day) in Arbore to see local life in a market at a crossroads for several tribes. Overnight stay in Turmi Lodge. An early morning drive after breakfast will take you an excursion trip to Murulle to visit the Karo people. The Karo adorn their bodies with different paintings, done for dance, feast, or celebration. After lunch you will return to Turmi and visit a Hammer village featuring a tribal dance. Overnight stay in Turmi/Buska lodge. Another early morning drive after breakfast to Omorate where you will cross the river in a dugout canoe to visit a Dassenech village. 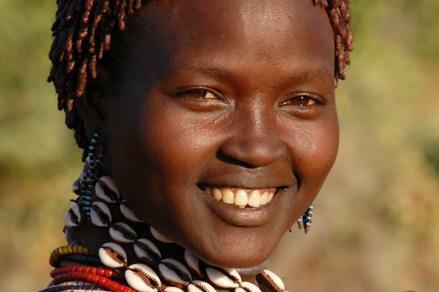 Omorate lies on the eastern bank of the Omo River and is almost totally isolated from the rest of Ethiopia. Witness how the Dessanech people live on the banks of the Omo river where they bathe and wash their clothes. Afterwards drive back to Turmi. Overnight stay in Turmi Lodge. Depart from Turmi to Jinka. On the way, stop in Dimeka for the local market, which takes place on Tuesdays and Saturday. This is one of the most colorful markets in the South Omo and is visited by Hamer, Benna, Karo, Tsemai and Ari tribes. Overnight stay in Jinka Resort. An early drive after breakfast takes you to meet the Mursi tribe after passing through the Mago National Park, located on the banks of the Omo River. Visit the Mursi in their traditional village, and see the Mursi women and their custom of expanding their lower lips with wooden and clay discs. Overnight stay in Jinka Resort Hotel. Drive to Konso via Key Afar and visit the Benna tribe at the local market in Key Afar, which takes place on Thursdays. Afterwards, continue driving to Konso, which has markets on Thursday. The Konso people are known for their totems erected in honor of the dead and their intricate agricultural terracing techniques. Overnight stay in Kanta Lodge. In the morning, visit a local Konso village and drive to Yabelo with stops to visit natural sand formations on the way. If there is time, visit the Yabello Wildlife Sanctuary. Overnight stay in Yabelo Motel. Visit El Sod, which is home to a large salt deposit called the House of Salt. There are several deep crater lakes here from which salt is extracted. You will also visit a local village of the Borena people. After the visit, proceed driving to Wondo Genet, where you can swim and relax in the hot spring pools. Overnight stay in Wondo Genet. After breakfast, drive a short distance to nearby Lake Langano, one of the Rift Valley Lakes, and the only lake that you can swim in. You will also visit Abiatta-Shala National Park’s two lakes: Shala is a very deep crater lake (over 260 meters deep!) and Abiatta, a soda lake attracting thousands of flamingos. Overnight stay in Sabana Beach Resort. After a morning relaxing around Lake Langano, drive back to Addis Ababa. After farewell dinner, check-in for flight back home.